Google's compact Nexus 5X has aged rather well and it's still among the first devices around to be stocked with new software. Now, it comes cheaper than before and if you can stand the plastic build, it's a great choice. The Nexus 5X has been updated to Android Oreo and it remains a cheap phone you can get away with using in 2017. It also uses Google's Project Fi network and comes at a discount these days. Of course, given the success of the Google Pixel and Google Pixel 2, we recommend its successors, but won't blame you for dialing back on the specs and price. Google's final batch of Nexus handsets comes in two sizes, and the 5.2-inch Nexus 5X is for those non-giants out there who literally can't handle a 5.7-inch Nexus 6P or its 6-inch Nexus 6 predecessor. The Nexus 5X is more than just a compact phone at a smaller price, though. Its 12.3MP camera is able to capture low-light photos, and the specs are still fast enough for the average user. Its reversible USB Type-C port provides quick charging, the fingerprint sensor is yet another way to effortless unlock your phone and swipe to pull down your notification panel. And possibly best of all, it's ready to go with Android's latest iteration, Android Oreo. Compromises and tough competition mean that the Nexus 5X isn't for everyone. The Nexus 6P requires two hands to operate, but it isn't a stretch to hold in one, making its size difference tighter and all-metal design and more powerful specs tempting. The Nexus 5X, made of plastic, faces far stiffer competition than the Nexus 5 did back in 2013. It's also not quite as fast as many rivals when under pressure. Multitasking with the GPS and playing music, for example, is going to see a bit of slowdown. The same happens when the camera app loads while you're switching from other heavy-duty applications. It's noticeable, but occasional and by no means a deal breaker. Easy-to-hold, priced right and feature-packed, this is the Nexus 5 reborn as the Nexus 5X, but over two years have passed since it broke cover. 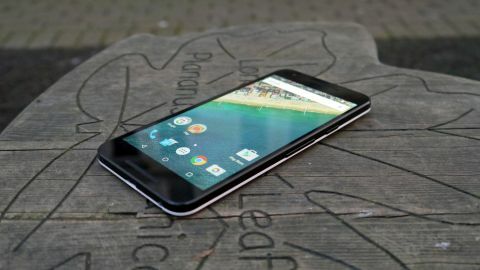 Is it still a worthy stock Android phone at an unbeatable value? Let's break it down. The Nexus 5X is no longer available through the Google Store, though it's easy enough to find it used on Amazon for under $200. It isn't the best value when put up to today's standards, but it's as cheap as you'll find a modern Google-branded smartphone. The Pixel will cost your around twice as much. The Nexus 5X looks and feels like the Nexus 5 adapted for modern times. It's lightweight and with a 5.2-inch display, my fingers can barely reach all the way across the screen. That's what I want. It pushes the limit of a one-handed phone with dimensions of 147 x 72.6 x 7.9mm, making it taller and broader, but ultimately skinnier than the idolized phone from 2013. Nexus 5X strikes the right balance: a screen size that's maximized, but still operable in one hand. I didn't exactly want a camera bulge around back, which is what happened to the center-located rear snapper, but I'd rather have what's there than a weak camera. Thankfully, the camera protrusion isn't as significant as we saw in leaked prototypes, and it at least gives me a landmark when trying to find the new, oddly-placed fingerprint sensor on back. The 5X owes its lightweight design to LG sticking to a polycarbonate back and thin metal frame. This bucks the trend of moving away from plastic and going with all glass or strictly aluminum. For this reason, it doesn't feel different from the hard plastic of the Nexus 5. It even has a similar soft-touch coating on the back. There are three Nexus 5X colors again, but this time it's Carbon Black, Quartz White and Ice Blue, doing away with red. All three come with a black front, however. You won't find an all-white Nexus 5X. The black-and-white combination makes my white Nexus 5X review unit look like a delicious ice cream sandwich more than a phone. In fact, the only glaringly impractical design choices here are the power button and volume rocker located on the right side. They're small, feel cheap and the power button isn't riveted or pronounced in any way really. That's a design choice I appreciate in recent phones like the Moto X Style and Nexus 6P. At night, it's easier to tell a power button accent with accents from a smooth volume rocker. There is a pulse notification light here. It hasn't been omitted, it's just tucked inside the speaker grill located at the bottom front of the phone and, rudely, turned off by default. Whether you're ready or not, the Nexus 5X includes the USB-C port on the bottom of the frame instead of micro USB, and it's joined by a 3.5mm headphone jack. As future-proof as this Android phone tries to be, it doesn't take advantage of Gorilla Glass 4 like the Nexus 6P does. Instead, it sticks to Gorilla Glass 3 like the curved LG G4. The LG G4 gets away with this in my book because of its protective, curved design. The Nexus 5X has only a small lip around its display bezel, so you may want to opt for a case. While the Google Store used to be flush with options, you'll definitely want to consult Amazon for your accessory needs. Thankfully, prices have dropped since the phone's launch, but they used to be quite expensive.